Our Fellows push the vision of MADWORKSHOP forward year by year. Handpicked from the most competitive design programs and burgeoning studios, these remarkable young thinkers bring their ideas from concept to reality during the course of their fellowship. Alberto was born and raised in Temecula, California, the land of the hot air balloons. Whether building forts as a kid or creating handmade duct-tape wallets with his brother, Alberto has always been a maker and a hands-on designer. He grew up wanting to be an architect and that dream only compounded when he discovered that the majority of architecture school involved model making. Alberto will be graduating in the class of 2019 from the University of Southern California with a Bachelors of Architecture Degree. While a student, he has been an active member of Alpha Rho Chi, a professional architectural fraternity on campus and a teaching assistant. On his spare time, he has also led free trainings on model making for his younger classmates. Alberto caught the eye of the the foundation with his participation in the inaugural class of the MADWORKSHOP Workshops taught by Riccardo Blumer in 2018. For his fellowship, he will be developing a table, chair, and stool set he designed in our Furniture Class taught by board member R. Scott Mitchell. Born and raised in Orange County, California, Kevin Shapiro has been skateboarding since an early age — a passion that has contributed to his attitudes towards architecture and design. He studied in Mammoth Lakes, Fullerton, and Costa Mesa, California before transferring to Portland State University where he graduated with a Bachelor’s of Science in Psychology. 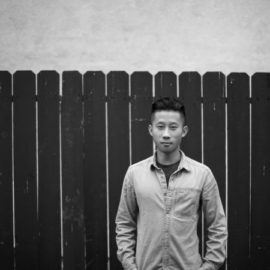 Following his two years in the Pacific Northwest, Kevin was admitted to the University of Southern California School of Architecture where he is currently a Master of Architecture 2018 candidate. As a designer at MADA s.p.a.m., Kevin worked closely with architect QingYun Ma to design and build the “Pole House,” a pavilion hanging from an existing electrical pole in Yushan Town, Lantian County, Xi’an, China completed in 2017. 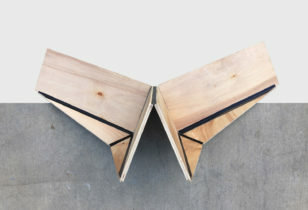 As a MADWORKSHOP fellow, Kevin will be developing a collapsible plywood chair and table set. The chair was designed to collapse flat for transport, inspired by Kevin’s years consistently uprooting during his undergraduate studies. 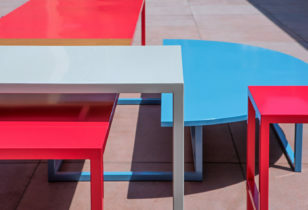 The table consists of glass and plywood to display and celebrate the coffee table book. 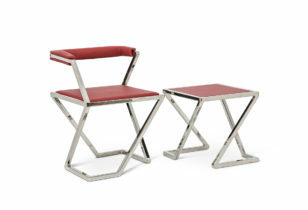 Both the chair and the table were designed in a dialogue between hand sketching and 3d modeling. Sketching is vital to Kevin’s design development process in addition to being an avenue for communicating ideas with others. Nahal Mohtashemi was born in California and raised in Tehran, Iran. She is currently a Master of Architecture student at USC and a designer based in LA with a background of studying and working in the Middle East. She has also worked as an architectural intern in Shanghai, China. 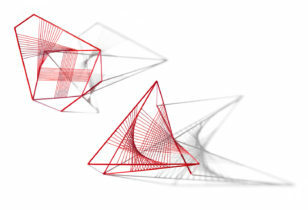 Nahal is interested in exploring simple geometries as a basis for generative form finding. She begins a design by first understanding simple geometrical relationships that later result in complexity in function, hierarchy, structure, and aesthetics. 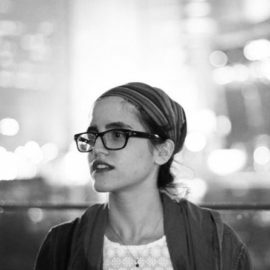 Nahal is currently part of the USC graduate studio program advised by Jose Sanchez in which architecture and design are approached through the medium of games. In this way social, cultural, urban, geometrical, and formal principals can be understood through the lens of game design. Nahal works across a variety of disciplines. 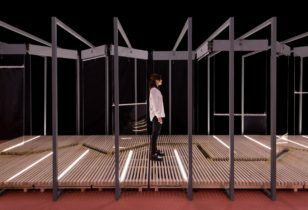 Her projects range in scale from urbanism to furniture design while constantly reconsidering the shared commonalities between the two. Joseph Chang enjoys designing with his hands. He grew up in the Bay Area, CA, where much of his time was spent building in his high school’s fabrication shop and father’s garage. 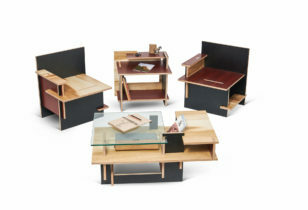 During his two years in the architecture program at the Illinois Institute of Technology, he found a passion for wood working and furniture design. In 2013, he transferred to the USC School of Architecture in pursuit of sharpening his design skills. 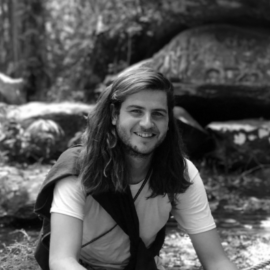 Joseph is currently a fourth year student and is interested in investigating furniture design within tiny homes. For his MADWORKSHOP fellowship, he will be prototyping a backpacking stretcher for emergency situations. The apparatus can be operated by a single person to carry heavy loads such as an injured person or loose items over rough terrain. 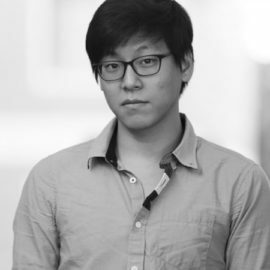 Heeje Yang is currently a student at University of Southern California pursuing his BARCH. 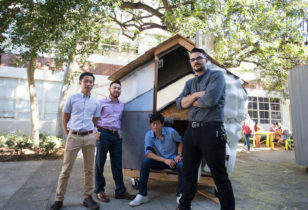 He joined Madworkshop after attending USC’s 4th year Advanced Topic Studio regarding to the problem with homelessness in Los Angeles directed by Sofia Borges and Scott Mitchell in USC School of Arhcitecture. 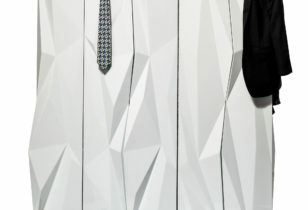 He has work experiences in multiple designer firms such as Michael Maltzan Architecture. As a fellow, he will be woking on Chair Six to be more easily operable through a study of origami folding and kinetic motion. He will also be preparing his 5th year thesis with an emphasis in kinetic motion through folding and unfolding algorithms. With a significant interest in design and fabrication, he will also explore the intelligence of interactive design through multiple moving objects from a pencil to a building. Since Jayson Champlain was a kid, born and raised in Torrance, CA, he has had a strong passion for architecture and design. 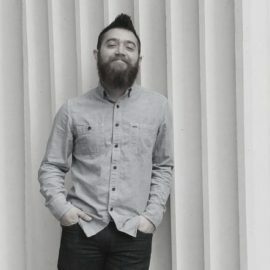 Starting with his legendary lego structures and early wood shop classes, Jayson always had a drive to create and work with his hands, so his mother jokingly told him, “You should become an architect.” From that moment forward, the only career path Jayson has ever pursued was architecture. 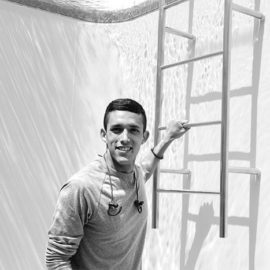 After obtaining an AA in Architectural Drafting from Saddleback College, Jayson was accepted into the USC School of Architecture, and was able to advance his architectural knowledge and craftsmen skills. Now in his forth year in the B. Arch program, Jayson has further developed his architectural abilities, and is interested in focusing his future career on designing socially conscious architecture utilizing innovative technology and representational techniques. 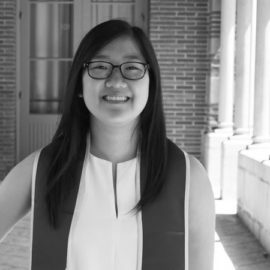 Belinda Pak is a fourth year student at the University of Southern California pursuing a Bachelor Architecture. Originally from Boulder, Colorado, she is now based in Los Angeles. After being part of the MADWORKSHOP’s Homelessness Studio, she was inspired to continue her efforts towards improving the lives of those less fortunate. As a fellow, she is designing and prototyping a wristband with built-in features that can aid a victim in an emergency, such as a beacon and internal storage for contacts and medical information. Jeremy Carman was born and raised in rural northern California in a small town called Shingle Springs. He grew up riding horses, racing motocross, raising animals and participating in fine arts. 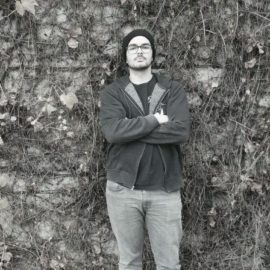 After three years of hand drafting and learning computer programs in high school, Jeremy gravitated towards the art of sculpting space and visual communication. He then pursued architecture at Cuesta College in San Luis Obipso. Once he earned an AS in architectural technology, Jeremy began setting his sights on the USC School of Architecture BArch program. Today he is finishing his fourth year and is exploring future solutions for people in need with design partner and co-fellow Jayson Champlain. As Jeremy continually grows as a craftsman and designer, his focus center’s on architecture’s ability to encourage learning in both users and observers. 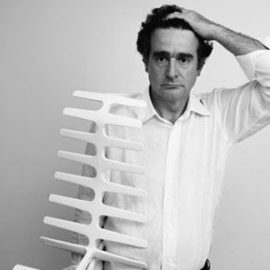 Graduating in 1982 with a degree in architecture from the Milan Polytechnic, Riccardo Blumer began his professional career at the architectural firm of Mario Botta. 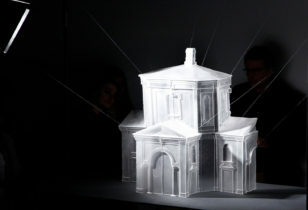 After five fruitful years with Botta, Blumer went on to found his current personal practice in Varese, Italy. His work spans from residential and industrial projects to industrial design and prolific partnerships with companies such as Alias, Artemide, Desalto, Poliform, Ycami, B&B and Flou. As a public and private interior designer, his projects include work on the Teatro alla Scala in Milan and several exhibition installations for the Triennale di Milano and the Musèe du Président Jacques Chirac. Recipient of the Design Preis Schweiz and the Compasso d’Oro, Blumer has also been added to the Museum of Modern Art’s (MoMA) permanent collection. Blumer now devotes his extensive background in architecture and industrial design to research and teaching. He is a professor in architectural and industrial design at the Academy of Architecture in Mendrisio- USI, the IUAV-RSM in S. Marino, NABA in Milan, and the ISAID in Vicenza. Blumer conducts research, lectures, and workshops in methodologies focused on creative design and cognitive training through physical exercises within the “esercizi fisici di architettura e di design”. Exploring the potential of interactive environments and their relationship to the human body, Behnaz Farahi is interested in the implementation of emerging technologies in contemporary art/architecture practice. Her goal is to enhance the relationship between human beings and the built environment by implementing design/motion principles inspired by natural systems. 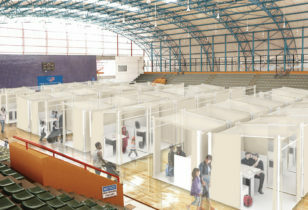 Application areas include architecture, fashion and interaction design. She also specializes in additive manufacturing and robotic technologies. Her work has been exhibited internationally and has been featured in several magazines and online websites including WIRED, BBC, CNN,The Guardian, Motherboard, Dezeen, Frame Magazine, The Creators Project and many more. Behnaz Farahi has won several awards and is the recipient of the Madworkshop Grant and the Rock Hudson Fellowship. Farahi has worked with leading firms such as Autodesk, Fuksas Studio, and 3DSystems / will-i-am. 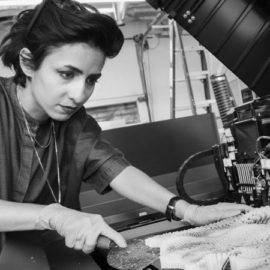 She has also collaborated with ProfessorBehrokh Khoshnevis on two NASA funded research projects developing a robotic fabrication technology to 3D print structures on the Moon and Mars. 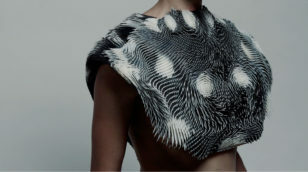 Most recently, she is an Artist in Residence at Autodesk Pier 9. Currently she is an Annenberg Fellow and PhD candidate in Interdisciplinary Media Arts and Practice at the USC School of Cinematic Arts. She has a Bachelor’s and two Masters degrees in Architecture. 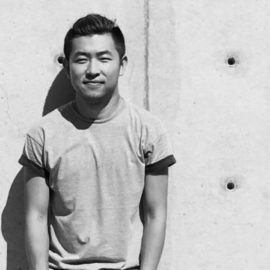 Daqian Cao is a designer who recently graduated from University of Southern California with a Bachelors of Architecture. He is originally from China and is now based in Los Angeles. His Hyper Chair is a project from the furniture design class taught by Scott Mitchell and John Uniack at USC School of Architecture. The Hyper Chair project won a fellowship and was sponsored by the Foundation to be further developed in its design and fabrication. Sonia Lui is a student at ArtCenter College of Design, pursuing her Bachelor of Science in Product Design. She is originally from Hong Kong and based in Los Angeles. She began working with MADWORKSHOP when she won a fellowship for a class sponsored by the Foundation and realized her design, Sanke, a multi-leveled communal seating system that encourages human interaction. The permanent installation was unveiled at the plaza at The Museum of Contemporary Art in Los Angeles in collaboration with the ArtCenter College of Design. Sonia is currently working simultaneously as a brand and product development consultant for Natural Link, a start-up lifestyle brand in Hong Kong; and as an R&D and Marketing intern at Herman Miller, also in Hong Kong. 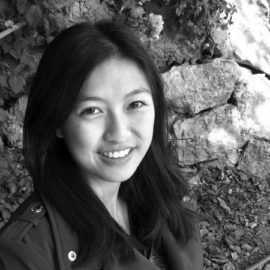 Joy Han recently graduated from the University of Southern California with a Bachelors of Architecture. Joy was born and raised in Texas and is currently based in Los Angeles. The CAD chair was a project that was designed during her fifth year at USC through the furniture design class taught by Scott Mitchell. 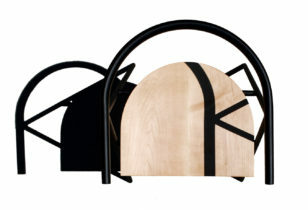 The CAD chair was one of the two final projects chosen and sponsored by the MADWORKSHOP foundation to be further designed for commercial production. 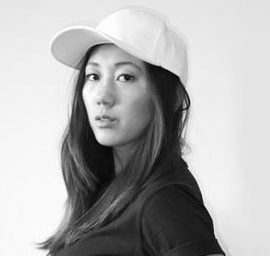 Diana is a designer, fabricator, and programmer from Los Angeles. 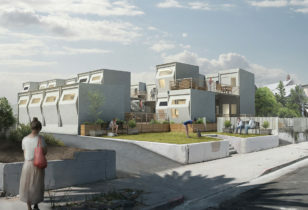 She began working with MADWORKSHOP as an undergraduate student at the Arroyo Bridge Studio at the University of Southern California Architecture School, a project sponsored by the Foundation. She joined the MADWORKSHOP team full time after graduating with a Bachelors of Architecture where she performed several construction activities involving concrete, wood and glass detailing; designed and constructed a small folly; and worked on the SIX Chair. She also helped edit and design Joy Ride, which documents MADWORKSHOP Founder David C. Martin’s journey to Mexico’s ancient and colonial sites. 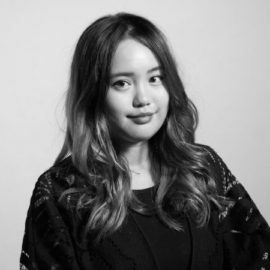 She is currently pursuing her Masters of Design Studies in Technology at the Harvard Graduate School of Design with a focus on exploring the implementations and implications of interactive digital fabrication methods.